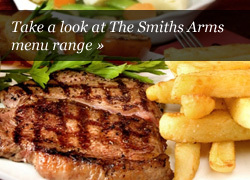 James and Jay would like to welcome you to The Smiths Arms Restaurant. We have a full selection of dishes suitable for everyone, including vegetarians and for the health conscious eaters. We also cater for Vegans and if someone would require a special meal then we are happy to accommodate if they contact us beforehand. Children are especially welcome and high chairs are available. If all you require is a starter or perhaps a dessert, please ask our staff and we will do our best to accommodate you. We are open every day at Lunch time between 12.00pm – 2.30pm and in the Evenings between 6.00pm – 9.00pm. 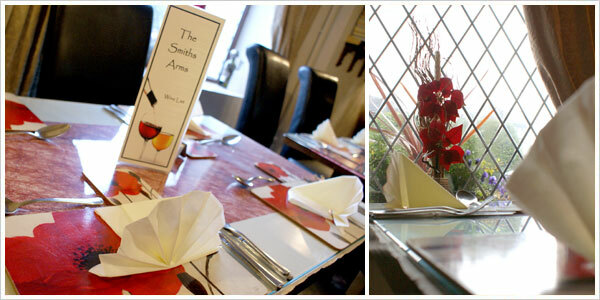 Sunday Lunch is from 12.00pm – 3.00pm, and the restaurant is closed on Sunday Nights. We have a Certificate of Excellence from Trip Advisor. Join us for our weekly special offers and Fresh Fish Nights are available every Thursdays and Fridays. The Fish Specialties vary every week and we pride ourselves on providing perfectly cooked Atlantic Cod in our Homemade crispy Beer Batter. A selection of our dishes are available to take-away, please get in touch or ask a member of our staff for more details.